Compare prices and book your Invercargill Airport rental car before you arrive. 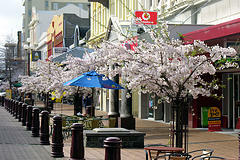 Invercargill is the southern most city in New Zealand and is the commercial city for the southern region. Invercargill has a training college which was the first of its kind to introduce no fees schemes into the education system of New Zealand. This scheme has been credited for the renewal in Invercargills popularity which was in steady decline leading up to this. Invercargill airport rental car companies will meet you off your flight. If you are planning on driving your rental car to the southern lakes area near Queenstown then make sure you stop at Manapouri and Te Anau.